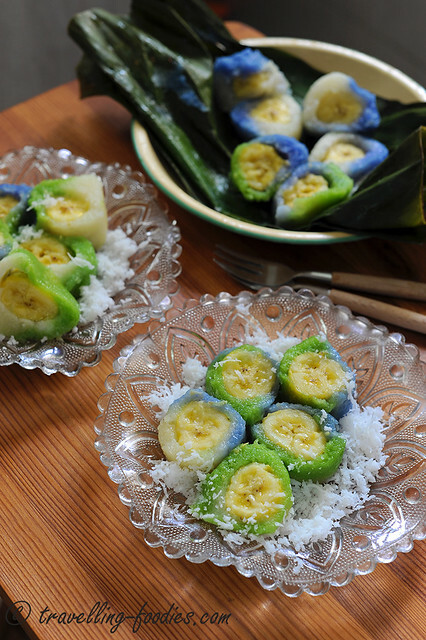 Most folks are familiar with the commonly available kuehs mentioned above but Putugal or Putu Tegair hardly resonate in many unless you have eaten it before. Unlike the other popular snacks like Ang Koo Kueh and Bingka Ubi Kayu, Putugal is hardly sold as part of the typical “Nyonya kueh” fanfare. I first got to know the name of this kueh almost 10 years back from the TV series “The Cook, His Food and the Dishy Nonyas”, just like how I learnt how to make Apom Berkuah. However, unlike Apom Berkuah which left a lasting impression, I’m afraid Putugal somehow did not. It was not until recently that I begin to “recollect” all these old kuehs from yesteryears that Putugal resurfaced again. It reminded me very much of something which my grandma made before when I was young, and it remained as a kueh that had no name. Until the TV show that is. Why did I mention mix and match for Putugal? 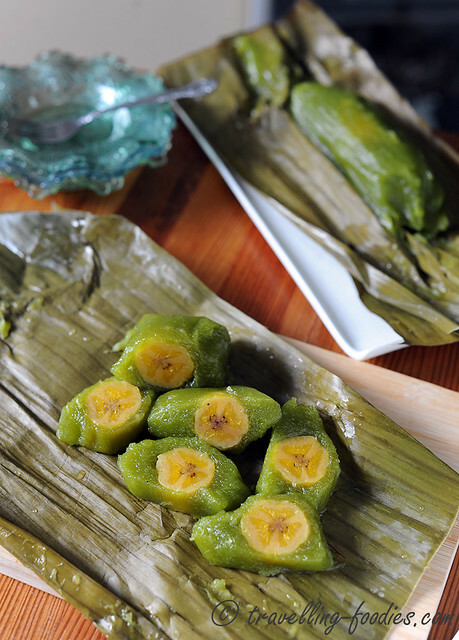 Just as with gula melaka, there are many variations of the same theme with banana-filled kuehs. 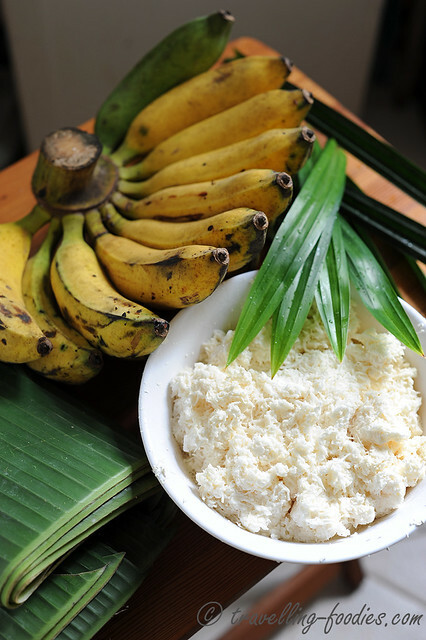 The mostly popular is Nagasari, which is also known simply as Kue(h) Pisang. It has its origins as a Kue from Indonesia, known to the Bugis as Kue Bandang-Bandang. 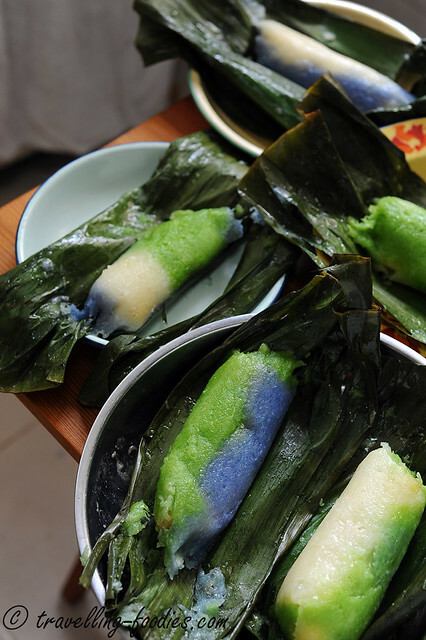 Unlike Putugal, Nagasari uses a flour batter which is made of rice flour, and/or tapioca starch, sago flour and even tepung kacang hijau which is otherwise known as “tepung hoen kwe”. 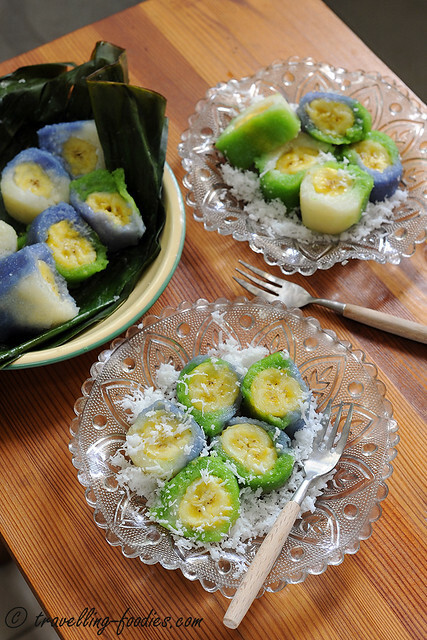 Another similar dessert is Pulut Dakap where the banana is encased in soaked glutinous rice instead. So all of them are essentially variations of the same theme. All similar but yet distinct at the same time. The recipe I’d used is adapted from Chef Florence Tan’s “Recipes from a Nyonya’s Kitchen“ where it could be found alongside her recipe for Apom Berkuah. My grandma didn’t leave behind a recipe. Not one which was written down at least. But I remember the flavours of the kueh vividly because she made it often, whenever she had orders. Florence Tan’s rendition is a gorgeous jadite green as only the juice extracted from pandan leaves was used. She’d used regular daun pandan as well as daun pandan serani for colour. I’d made the recipe a couple of times, the first time following Bibik Florence’s version to use only pandan juice extract. But I remembered we made it blue and white instead. My initial trials at wrapping were sloppy as the ubi kayu did not produce a perfect ring around the pisang rajah within. Then I made it with a juxtaposition of colours in green, blue and white, as in the Eurasian version from Quentin Pereira’s book “Eurasian Heritage Cooking”. What a riot of colours it was! I’d also made this during a cooking demonstration to the wonderful ladies from the Indian Women’s Association, where it was showcased together with other nyonya delights like Popiah, Ondeh Ondeh, Kueh Dadar, Bingka Ubi Kayu and Penang Otak Otak. The technique for processing the grated cassava is pretty much the same with making Bingka Ubi Kayu, Talam Ubi etc. The grated cassava has to be squeezed to extract the sap, which is left to stand for the starch to separate from the water. The water is then carefully decanted and the sedimentary starch is recombined with the grated cassava together with coconut milk, sugar, tapioca starch etc. 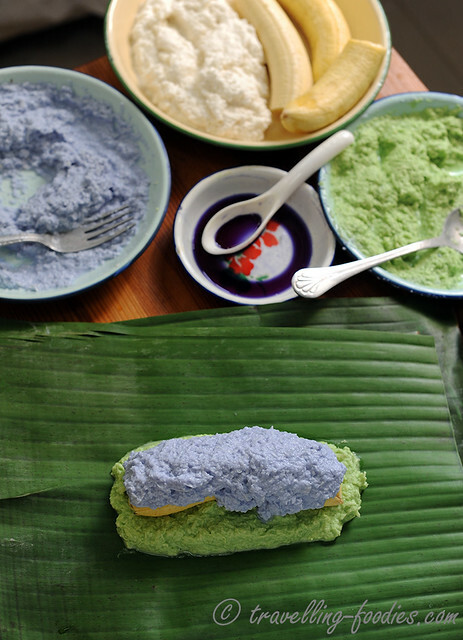 I’d divided the batter into three portions and coloured two of them green and blue with the juice from pandan leaves and butterfly pea flower respectively. One part is left white for contrast. When this is all done, all that is left is the wrapping, yet again another game of mix and match of colours! First, prepare pandan extract by cutting pandan leaves into small pieces and blending with as little water as possible (adjust to individual model of blending machine). Squeeze as much juice from the pulpy concoction and strain 2-3 times over a fine-wired sieve or muslin cloth. Set aside the juice in a clear container for 4-6 hours at room temperature or overnight in the fridge for the extract to concentrate and settle at the bottom of the container. 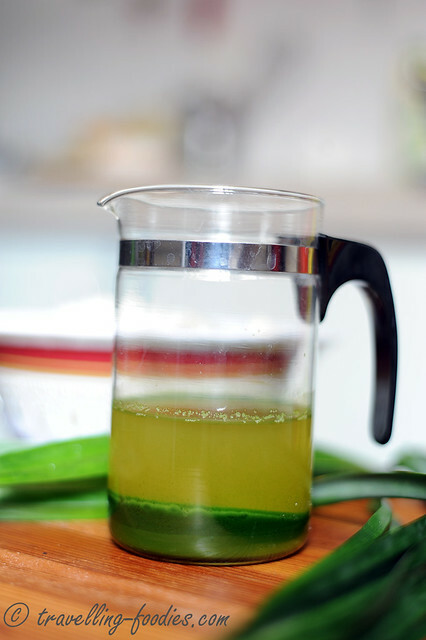 Carefully decant and remove the top clear layer leaving behind the concentrated pandan juice extract. Set aside for later use. To prepare bunga telang juice, add dried or fresh butterfly pea flowers with 1/2 cup of water into a saucepan and heat over medium-high flame. Press down the flowers with a spatula or spoon to help with the leaching of blue pigments from the petals into the water. Turn to medium-low or low flame and leave to simmer with lid on for about 5 min. Remove lid and allow excess water to evaporate and concentrate the extract. Should be left with 1-2 tbsp worth at the end. Leave to cool slightly and squeeze as much liquids out of the petals as possible. Set the extract aside for later use. Omit the above steps for natural food colouring extract if commercial food colouring are used. To prepare grated cassava and tapioca starch, first rinse the cassava tubers to remove any debris. Cut a shallow slit along the length of the “skin bark” and proceed to peel it off. It should come off quite easily. Grate the cassava but avoid the tough fibre that runs along the length of the tuber. Factoring attrition of tough fibre and skin, the remaining grated tapioca should come up to 800g. Squeeze grated cassava with a muslin/cheese cloth or over a fine-wired sieve and collect the juice in a bowl beneath the sieve. Set the dehydrated cassava pulp aside for later use. Leave the starchy juice in the bowl to settle for 15-20 min for the tapioca starch to settle to the bottom of the bowl. Carefully pour and decant the bitter sappy juices, leaving behind a layer of tapioca starch at the bottom. Discard juice and retain the tapioca starch. Recombine tapioca starch with dehydrated cassava pulp, coconut milk, a generous pinch of salt, sugar and tapioca flour in a mixing bowl. Divide into 3 portions. 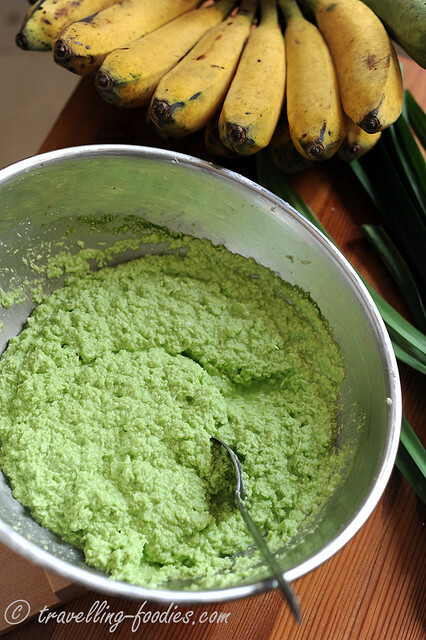 Add the pandan juice and bunga telang extract to two portions respectively, leaving one portion white. Wilt banana leaves over boiling water or open stove flame until soft and pliable. 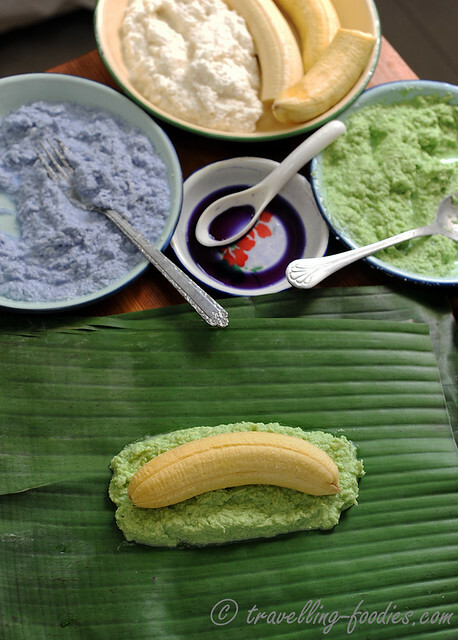 Place a piece of banana leaf on a flat surface and place 2 tbsp of cassava mixture (any colour) over it, spreading out the mixture to be slightly longer than the length of the bananas used. Place a peeled banana over the mixture and add another 2 tbsp of cassava mixture of a different colour over the banana. Bring the two lengthwise sides of the banana leaf upwards and nudge the cassava mixture to form a cylindrical ring over the banana, covering it completely. Roll the banana leaf into a tubular form and twist one of the open ends to enclose the mixture and fasten with toothpicks. Proceed to do the same with the other end. Steam the rolls over rapidly boiling water for 15-20 mins until cooked. Leave to cool, meanwhile, steam the grated coconut mixed with a small pinch of salt and some shredded pandan leaves. Unwrap the cooled putugal and slice diagonally. Coat the slices with grated coconut and serve. I am submitting this post to Little Thumbs Up September – Pandan hosted by Joceline @ Butter, Flour & Me, organized by Zoe@ Bake For Happy Kids and Mui Mui @ My Little Favourites DIY. This entry was posted on September 25, 2013 by Alan (travellingfoodies). It was filed under Food, Simple Eats and was tagged with Baba, bunga telang l, eurasian, kristang, malacca, melaka, Nonya, Nyonya, pandan, Peranakan, pulot dakap, Putu tegar, putugal, straits chinese. Wow, love the organic colours. Haven’t eaten these for ages ! I remember seeing this at Florence Tan’s book too… Yours look great with the pretty blue shades. Alan, this kuih look very nice ! The colour so sharp. Thanks for sharing & link.